These concepts are useful for understanding and solving various geometry problems. Intersecting lines are lines that meet at a point. When two lines intersect, they define angles at the point of intersection. Parallel lines are lines that never intersect. The distance between the two lines is fixed and the two lines are going in the same direction. Perpendicular lines are lines that intersect at one point and form a 90° angle. The following diagrams show the Intersecting Lines, Parallel Lines and Perpendicular Lines. Scroll down the page for more examples and solutions. The following video gives a definition of intersecting lines. The following video gives a definition of parallel lines. Parallel lines are coplanar lines that do not intersect. The following video gives a definition of perpendicular lines. Song to help you remember what are parallel, perpendicular and intersecting lines. The above relationships between lines take place on the same plane. However, skew lines only happen in space. 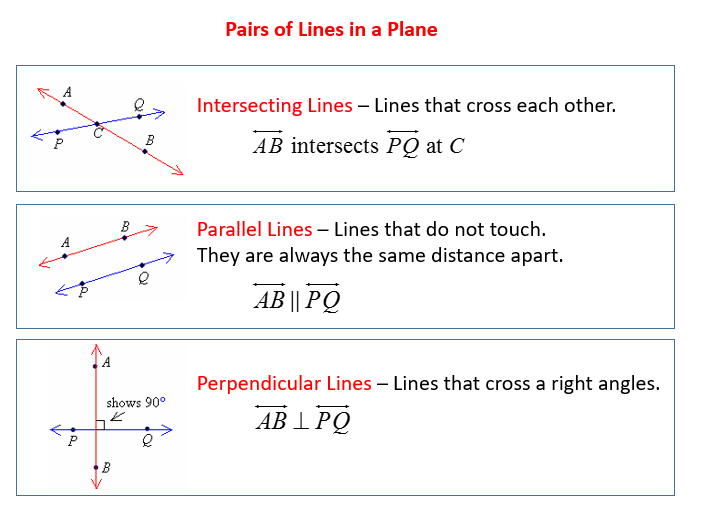 Skew lines never intersect because they are not on the same plane. Skew lines are difficult to draw because they exist in the three dimensional space. Lets consider a cube. along the edges of a cube as shown, and line running on the front surface of the cube. They are lines in different planes and will never intersect. The following video gives a definition of skew lines. Difference between parallel lines and skew lines. Parallel lines are two coplanar lines that never intersect. 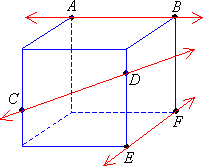 Skew lines are lines that are not coplanar and can never intersect.